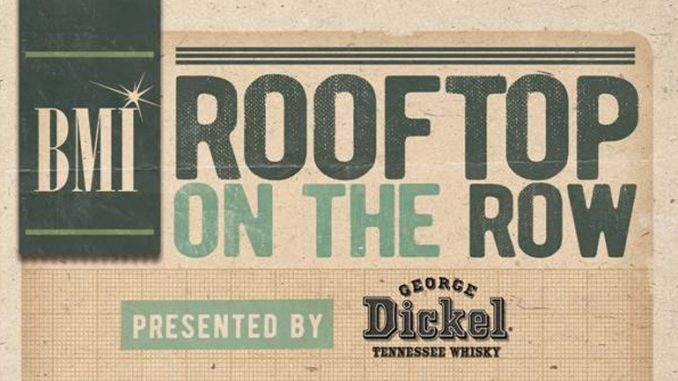 This one is for the musicologists and mixologists and it’s a fact that the BMI Rooftop On The Row Series has become one of our favorite events in all of Nashville. The stars lined up yet again for a perfect summer evening of entertainment on July 17, 2018 at 10 Music Square East featuring the talents of Kalie Shorr and Morgan Wallen. Kalie Shorr showed assurance as she prowled the BMI rooftop stage. Did we mention the alcohol? You can really mix it up at this mixer as the cabinets are fully stocked by the event’s generous and refreshing slate of sponsors that included George Dickel Tennessee Whisky, Topo Chico, Sam Adams and Twisted Tea all there to guarantee that anyone who wanted them had a drink in their hand. To ensure attendees had some good food in their stomachs the always excellent Texas Roadhouse was manning their spot and serving up ample BBQ pork, chicken, salad, chips and cookies for the rooftop revelers. Musical nourishment came in the form of Kalie Shorr who is having a year to remember coming off her 4th appearance at the Grand Ole Opry and the CMT Next Women of Country Tour. The attractive young performer was also recently named by Rolling Stone as one of the “CMA Music Festival 2018: 30 Best Things We Saw”. Tennessee native Morgan Wallen headlined by showcasing songs from his recent debut album including the well-received and FGL approved “Up Down”. 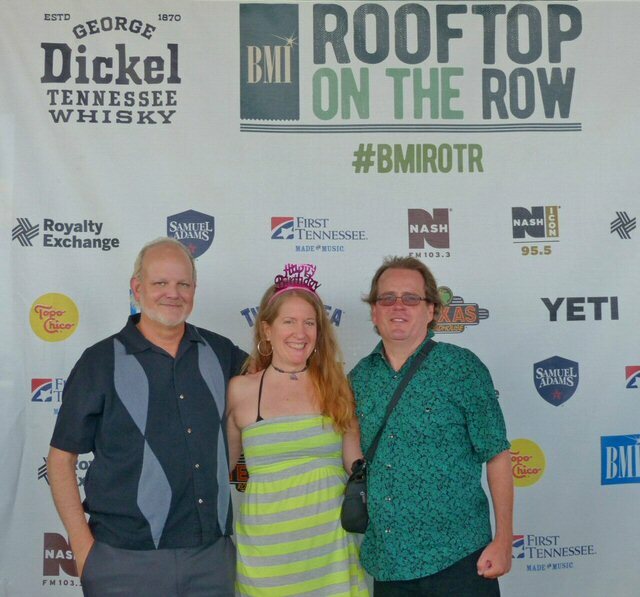 Jay Pounders, Javelyn and Rockin’ Rich Lynch make it to the top of Music Row. As we roamed the crowded BMI rooftop we ran into a number of new Nashvillians including a pair of lovely ladies from San Diego, California and Buffalo, New York who moved to Mid-Tenn only five weeks ago from both coasts to become roommates in Music City. And, we had the pleasure of meeting Javelyn from Los Angeles who will be relocating to town in August with a head full of ideas. She enthusiastically detailed her dreams of creating an artist collective to MCN’s Rich Lynch and musician Jay Pounders. Stay tuned! BMI’s Rooftop on the Row series pairs up-and-coming Country and Americana singer-songwriters with veteran performers, enabling industry influencers and fans alike to enjoy the casual vibe on the Nashville office’s scenic roof while listening to some of the genres’ hottest new and established acts. The party continues in August with more hot sets from Mitchell Tenpenny and Lindsay Ell. 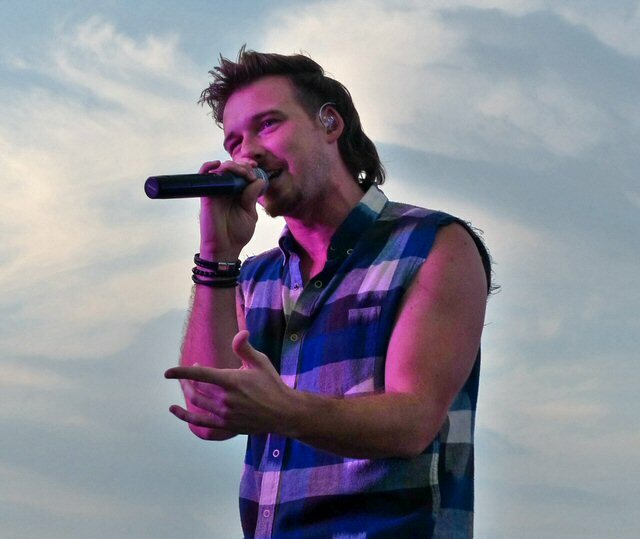 Morgan Wallen brought the rock to the party with a slate of upbeat numbers.